I hope you enjoy my first book review for Hanging on Every Word, for it is in fact my first ever book review. Synopsis reads: Jack Reacher is alone, the way he likes it. He watches a man cross a New York street and drive away in a Mercedes. The car contains $1 million of ransom money. Reacher's job is to make sure it all turns out right - money paid, family safely returned. But Reacher is in the middle of a nasty little war where nothing is simple. What started on a busy New York street explodes three thousand miles away, in the sleepy English countryside. Reacher's going to have to do this one the hard way. 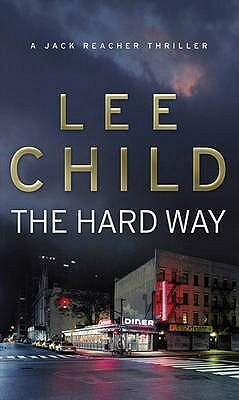 My Review: The Hard Way is the tenth book Lee Child has written about the character Jack Reacher. All of the Jack Reacher books stand on their own, there is no need to have read any of the previous books. The book starts with Reacher an ex army cop unknowingly witnessing a kidnapping money drop. With the family of missing Kate eager to know all that Reacher witnessed, it soon becomes apparent they are not your average family. Reacher want to to help put right this wrong and to help reunite Edward Lanes family. With strictly no police involved all of Reacher's investigative skills are required. Edward Lane seems a little cagey divulging his history - a previous wife also kidnapped, his own Mercenary army, and the ability to pay kidnappers millions in cash within hours. Reacher has to balance investigating and resolving the kidnapping, whilst trying to discover the truth about Edward Lane and his loyal mercenaries – or are they loyal? There are twists and turns a plenty as the kidnapping develops. Although I did predict two elements of the kidnapping plot as I progressed though the book, there were still plenty of the story I could never have predicted. I liked the relationship between Reacher and Pauling the ex-FBI agent involved in investigating the kidnapping of Lane’s first wife. Both respecting and bouncing off each others methods of investigating, though not always agreeing. Yes, there is something between the two, but it is not love – Reacher never does love. Through the book Reacher wants to ensure the right thing is done, this includes payback for any wrong doing and payback in the most appropriate and deserving way. An aspect of his character I actually found quite endearing. Lee Child does not shy away from violence in this book, any story that features a small army of mercenary is never going to just play nicely. This is no fluffy read, I accept that violence has a place in this story, there is one particular scene set in West Africa that stayed with me. That said this is not just a book to be read by men, as a woman I really enjoyed this book. When Lee Child writes a female character they are usual strong, intelligent woman. Pauling the ex-FBI agent, Kate the kidnapped wife, Patti the sister of Lanes first wife and Dee Marie sister of Hobart one of Lane’s mercenaries -all exceptional female characters. I guarantee once you pick it up you will not be quick to put it down. Never will you read 500 pages quite so quickly. You know how it goes with a good book. I will just read to the next chapter and then I will turn the light off and go to sleep – yeah really, that was at midnight its one a.m. and the light is still on! I gave this book 4 stars out of 5 on Goodreads where it had an average of 4.5 stars. To find out more about the book or the author Lee Child visit the following links. I dabbled with Lee Child a few years ago, and have just started reading the series again from Book 1 - hooked.